I'm in the mood for the Spring weather now. Anyone else? Yes!! 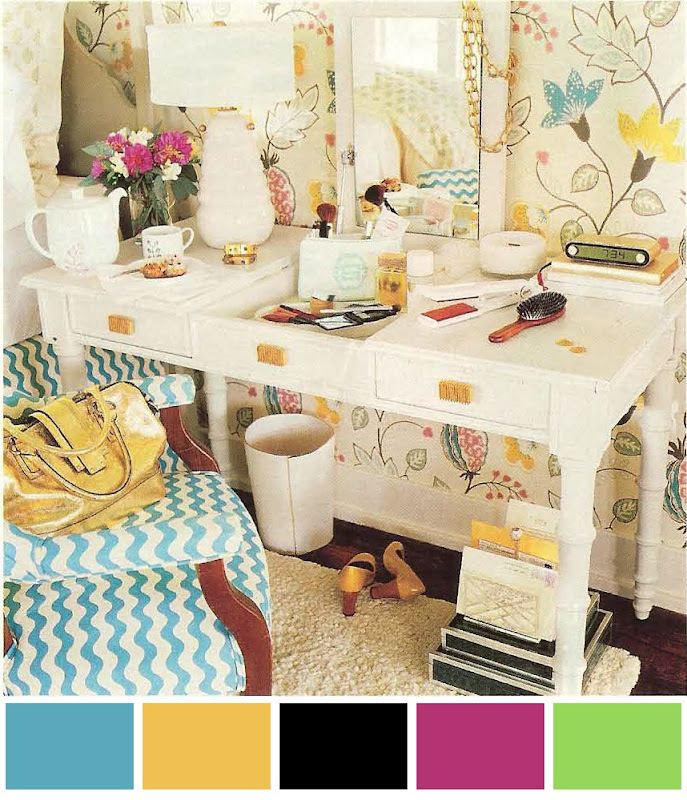 It's in the 70s today and I could not be more excited for Spring :) Cute vanity! i love this!! i am so ready for spring...i think i could get ready every morning in that space..hehe. that chair is awesome. Gah! LOVE that wallpaper. It's sunny and 75 degrees here today so I am definitely enjoying Spring! Love those colors!! It was slightly sunny and warm this afternoon and I'm hoping it stays like that! So ready!! Especially if I could have a room like this!! and right click save. i LOVE this room! Yes, yes, yes! So ready. I am obsessing over that chair and the fabric! So much fun. I love Spring! THat's really pretty. I'm actually planning on redecorating you gave me GREAT ideas. I would kill for that vanity. Yes I would. Definitely!! The weather is still ridiculous here, but the snow has FINALLY started melting. Love the colors in that photo! And I agree with everyone else - lovely wallpaper!! Bad case of "Spring Fever" here. I want to paint everything with a fresh coat, like an Easter Egg, pretty, pastels with a hint of licorice. YES!! And i LOVE that chair, that wallpaper, that desk. so springy! Me too! I LOVE this image - the chair, the wallpaper, the desk -- everything. The colors are perfect. Patricia- that is the best description of this photo- black licorice is my favorite Easter candy too! gorgeous! i love love love that vanity. I love everything about that image. I think I may want to subscribe to Southern Living now. Hooray! Finnnally! Love that chair! ohhh I just want this whole picture! its so fun and makes me think of summer! Okay... I need that whole set-up. It's fabulous. That wallpaper is divine, and this whole image makes me realize I really want a dressing table in my next apartment!